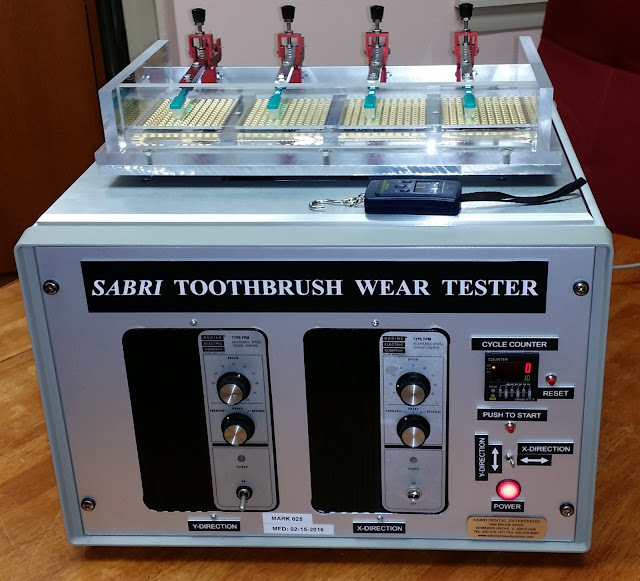 Information: Sabri toothbrush wear tester has been designed to evaluate the efficacy and durability of commercially available manual and power toothbrushes. The apparatus is capable to test 4 toothbrushes simultaneously under the brushing pressure forces ranging from 25 - 1000 grams accurately with a calibrating load cell and digital indicator. The brushin action is regulated in X and Y cross motion with adjustable speeds between 1-60 rpm to a distance of 5cm W x 8cm L in a plastic tray (toothpaste slurries reservoir). A rectangle flat stainless steel plate machined with a special design shape grids is placed in tray with toothpaste slurries to test simulate constant brushing of oral environment. The brushing strokes are programmed and monitored on a digital counter with an X / Y directional count switch. The brushing motion is selected to operate in clockwise or counter clockwise direction with a switch on X / Y cycles and motion speed controllers. Operating voltage: 115-220v AC/50-60 Hz.